After months of unemployment, 57-year-old Steve Pruner decided to create his own job selling hot dogs in downtown Durham. 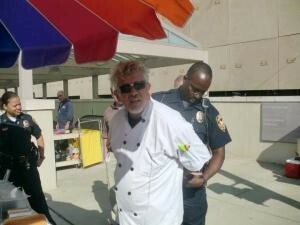 Problem is, state laws and regulations called “onerous” by a Durham County health official have sidelined Pruner’s hot dog cart. Pruner, a former executive recruiter for a company conducting clinical research trials, had to find another line of work when the economy went bad. Self-employed, with a mentally handicapped 26-year-old daughter and a 48-year-old brother on kidney dialysis depending on him for support, running a hot dog cart seemed to be the ticket. It wouldn’t require much capital, he could be his own boss, and he could even build a cart himself, he thought. Unable to build a box-on-wheels that satisfied city planners, Pruner ended up purchasing a “professional” pushcart for $2,500. Next, he set out to get a vending permit from the city, but found out he also would need to get a health permit from the county. Total cost: $150. Before he could get a health permit, however, he’d need an inspection. To get an inspection, he would have to enter into a “commissary agreement,” requiring him to prepare his food, wash his cart, and store his supplies in a permitted restaurant or commissary. Pruner claims it’s nearly impossible to convince a restaurant owner to enter into such an agreement, unless you are a friend or family member. Those who do make the agreements hardly ever honor them, he said. Finding the rule an “undue restriction” on what he deems his “constitutional right to work,” Pruner chose to ignore it and to open his business — Outlaw Dogs — without permits about nine months ago. Since then, the health department has tried to shut him down three times — first politely asking him to leave his vending spot, then issuing a cease and desist order and suing to have him declared a “public health hazard,” and finally having him jailed for 24 hours on Oct. 27. The Durham County Superior Court issued a permanent injunction against him Nov. 2, and his business has been closed ever since. Mark Myer, food and lodging supervisor of Durham County Health Department said the commissary rule is state law, enforced by the North Carolina Department of Environment and Natural Resources (PDF download). The law and subsequent regulations were enacted in the early 1990s and haven’t been updated since. Myer admits there is no way to ensure that vendors are using the facilities on a daily basis. “They are sort of on the honor system,” he said. Myer disagrees that it is “nearly impossible” to get a commissary agreement and points to the county’s 18 permitted hot dog vendors as proof. However, he said it is unclear how many of those permits are active. The Institute for Justice, a libertarian civil liberties law firm, has taken interest in Pruner’s case. Robert Frommer, a staff attorney specializing in economic liberty cases, suspects restaurants are behind the regulation. “We’ve seen this in a number of cities around the country, where brick and mortar restaurants want to use the power of government to prevent honest competition,” Frommer said. If the government were interested in protecting public health, he said, there are less burdensome ways to do it, such as inspecting the vendor’s home and/or his pushcart in the location of operation. Pruner plans to take his case to the North Carolina Court of Appeals.